SMPS, the recognized leader in education and information for marketing professional services, offers a credential that recognizes the marketing expertise you have achieved: Certified Professional Services Marketer (CPSM). Your marketing skills are vital to the lifeline of your firm. Every day you further your company’s growth by identifying new project opportunities, developing business relationships, and getting your company’s name in front of prospective clients. That’s your job as a professional services marketer. When you apply for the CPSM program, you are taking your first step toward joining a distinguished group of professionals who have made a commitment to professional excellence, career advancement, and an ongoing pursuit of knowledge through the SMPS Domains of Practice. Based on a role-delineation survey conducted by the Society, the domains outline the day-to-day functions of professional services marketers and business developers. Earning the CPSM designation proves proficiency in the domain’s knowledge areas and skill sets and sets the bar for professional expertise and excellence. Who doesn’t love money back? As an incentive for passing the CPSM on your first try, SMPS Colorado is offering a scholarship to reimburse the exam fee for five (5) individuals. After you have taken the exam and passed, please fill out this form and send to Dannie Dilonno. A reimbursement check for the fee will be mailed back. The initial application fee is not covered by this scholarship. If you would like additional information or have any further questions regarding the CPSM Study Group and Exam Reimbursement Scholarship, please contact Jessica Nichols or Christine Clippinger. SMPS Colorado is pleased to offer a FREE CPSM Study Group led by Christine Clippinger and Jessica Nichols. The CPSM Study Group will kick-off February 27, 2019 and meet bi-weekly on Wednesdays from 11:30 AM to 1:00 PM. We will focus on the concepts and principles found in the SMPS Domains of Practice for Professional Services Marketing and Markendium: The Essentials. The Study Hall duration will be eight (8) sessions and conclude with marketers scheduling a date to take the CPSM exam at their convenience. 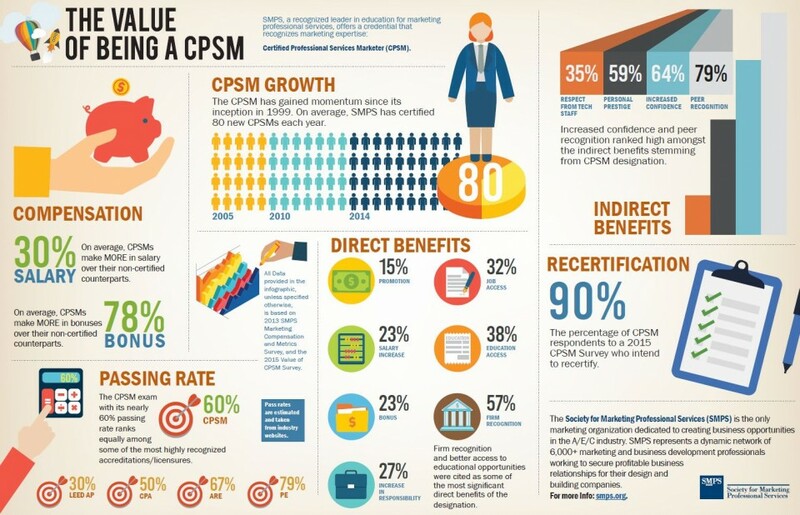 To learn more about CPSM Certification and eligibility visit www.smps.org/learning/certification. We will hold an informational meeting on February 12, 2019 at 12:00 PM at Pinkard Construction (9195 6th Avenue, Lakewood, CO 80215). "The CPSM program has provided me with far-reaching benefits that have exceeded my expectations. I hold a number of other professional certifications, and none of them has been accompanied by the same sense of community as the CPSM. The SMPS Colorado CPSMs promote each other’s success by offering a variety of resources and advice. On a national scale, the CPSM message boards provide an invaluable forum for exchanging information and ideas. I truly did not anticipate the feeling of solidarity that comes along with earning the CPSM designation; it really feels like I have someone (or a lot of someones!) “in my corner.” This program has not only given me the confidence I need to move forward on my own career path, but it has also afforded me a glimpse of future career possibilities after achieving the certification. I honestly didn’t imagine that four little letters could make such a big difference! I would strongly recommend this program to other professional services marketers." Listen to what some of SMPS Colorado’s CPSM’s are saying about the benefits, both professionally and personally, of the certification process by visiting the SMPS Colorado YouTube page. Whether you are looking to take the CPSM (Certified Professional Services Marketer) exam or would like to expand your A/E/C marketing & business development knowledge, this study hall is for you! Your marketing & business development skills are vital to the lifeline of your firm. The CPSM Study Hall are designed with this in mind, utilizing the following approach: structured reading plan, concept understanding though presentation and discussion, and learning through teaching. Every day you further your company's growth by identifying new project opportunities, developing business relationships, and getting your company's name in front of prospective clients. SMPS, the recognized leader in education and information for marketing professional services, offers a credential that recognizes your achieved marketing expertise, the Certified Professional Services Marketer (CPSM). Four letters that will change your career! Are you ready to actively take your career to the next level? We’re looking for people who have the drive to invest in themselves, the desire to engage and share with colleagues, and the motivation to demonstrate their commitment to the profession. If you have a bachelor’s degree and 4 years of experience in the A/E/C industry, or an associate’s degree with 6 years of experience, or without a degree but with 8 years of experience, you’re eligible to sit for the CPSM certification exam! We encourage interested candidates to apply to sit for the CPSM Examination, as the application process can take some time. We also recommend visiting the Study Section to familiarize yourself with the reading and study guide.